Tranquility Base Hotel & Casino is out May 11 via Domino Records. See the album cover and tracklist below. English rockers Arctic Monkeys just announced their highly-anticipated sixth album will be released on May 11 via Domino Records. 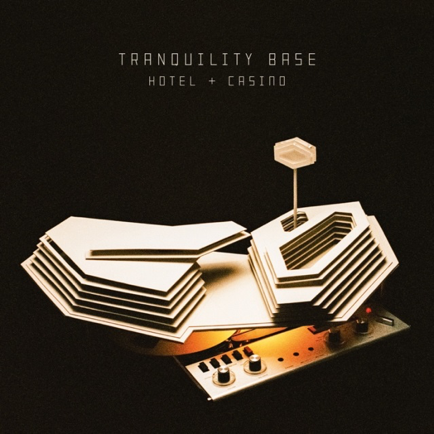 The album is entitled Tranquility Base Hotel & Casino and is produced by Alex Turner and James Ford (Depeche Mode, Haim). Tranquility is the band’s first album in five years and follows their critically-acclaimed album AM, which debuted at #1 in multiple countries and #6 on the Billboard 200. AM is also the band’s most successful album, to date, and produced a slew of viral singles, including “Do I Wanna Know?,” “R U Mine?,” “Why’d You Only Call Me When You’re High?,” “One for the Road,” “Arabella,” and “Snap Out of It.” Collectively, the tracks boast over 1.2 billion Spotify streams. News of the new album is accompanied by a short video teaser that depicts the album’s cover art rotating in succinct motion while a vibrant organ echoes in the background. The organ then flows into an exciting and gritty guitar riff, hinting that perhaps a new single is soon forthcoming. Arctic Monkeys recently announced a massive international tour in support of the new album, with dates including headlining sets at Firefly, Lollapalooza, Osheaga, Primavera Sound, and many more. Check out the tracklist and full dates below.